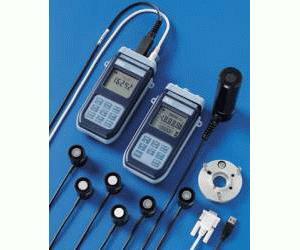 The HD2102.1 and HD2102.2 are portable instruments with a large LCD display. They measure illuminance, luminance, PAR, and irradiance (across VIS-NIR, UVA, UVB and UVC spectral regions or measurement of irradiance effective according to the UV action curve). The probes are fitted with the SICRAM automatic detection module. In addition to detection, the unit of measurement selection is also automatic. The factory calibration settings are in memory. In addition to instantaneous measurement, the instrument calculates time integral Q(t). Some thresholds can be associated with the integrated measurement and with the integration time, which can be set in the menu. When exceeded, these thresholds cause the instrument to stop the integral calculation. The storing interval, printing, and baud rate can be configured using the menu. The HD2102.1 and HD2102.2 models are fitted with an RS232C serial port and can transfer the acquired measurements in real time to a PC or to a portable printer. Functions include Max, Min, Avg, REL, HOLD, and automatic power off.